Mr Drummond 1966 – 1978 ? This example has a Riley Pathfinder engine, fitted by previous owner David Vine in 1959. Finished in dark blue with red interior, ‘VTW 5’ is offered with publicity pamphlet, specification sheet, price list, sundry photocopies and Swansea V5 registration document. Eligible for many prestigious events such as the Goodwood Revival meeting for modest outlay. The Donald Healey Motor company completed its first car in 1945, going into full-time production the following year. The firm’s first offering was a 2.4-litre Riley-powered sports saloon with welded-up chassis and Healey’s own trailing arm independent front suspension. For the clubman racer there was the dual-purpose Silverstone, a model equally at home on road or track. The saloon’s engine and basic underpinnings were retained, though with shorter frame, stiffer springing and - unusually for the time - a front anti-roll bar. The lightweight two-seater body was crafted in aluminium, and the car’s purposeful look was enhanced by cycle wings and closely spaced headlamps mounted behind the radiator grille. Another novel feature was the spare wheel protruding from its compartment in the tail, thus doubling as a bumper! The Silverstone was soon making a name for itself in rallying and circuit racing, with many future stars gaining their first track experience in the car, most notably Tony Brooks. In all, 104 Silverstones were built between 1949 and 1951. 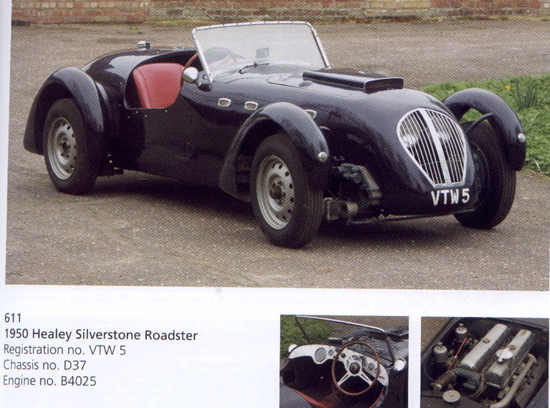 We are advised that this example has a Riley Pathfinder engine, fitted by previous owner David Vine. Finished in dark blue with red interior, ‘VTW 5’ is offered with publicity pamphlet, specification sheet, price list, sundry photocopies and Swansea V5 registration document. Eligible for many prestigious events such as the Goodwood Revival meeting for modest outlay.